This part of the typography series is about the different kinds of ligatures and their functions. How about multilingual and symbol series? like acute, grave, eth, Mu, plus minus, paren, ampersand, etc, have you created those stuff? #1 Is not suitable for turkish users. What's a good reason to revive these ligatures? I just want to listen to your opinion about these. 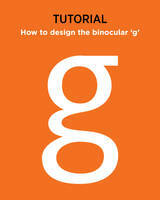 My take on Number 1: I thought that digital typography would liberate us from the material constraints of typography. My take on Number 2: This is understandable if calligraphy and metal sculpture is the basis. 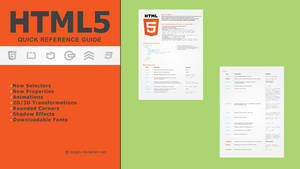 My take on Number 3: Why can't the color and rhythm be pre-adjusted and evened out before releasing the typeface? 1. There was a decline in the use of ligatures at the end of the 18th century as they started to abandon these extra features because it's easier to set type with fewer characters. Later came the typewriter and typography became even more stripped down of its features. That's also how we abandoned the use of the en dash and em dash and instead we tend to incorrectly use hyphens these days. With digital type and especially with the introduction of OpenType functionality you see a return of all the features one would expect to have in a typeface. Ligatures are important. #1 is important because without ligatures these areas where the terminals and tittles come too close or even touch become disturbances in the reading experience. For typographers and type designers like myself these can even be major frustrations, although I have to admit that complaining about bad typography is also a recreational activity of mine. It may not sound like much, but a big heading in a newspaper will look much more pleasant with ligatures, and reading a book without these standard ligatures will become tiring on the eyes, just as certain typefaces would tire the eyes. Most fiction books are still set in typefaces like Caslon, Bembo, Minion and Garamond. Anyway, to finally cut it short, digital typography not only liberates us from material constraints of typography, it made it easier than ever before to do professional type setting. In fact, much more perfect than the old master typographers of the Baroque ever could, but then nowadays we find this imperfect letterpress printing to have a desirable effect; it looks and feels like higher quality, more authentic and "warmer", and so there is somewhat of a return to some letterpress printing. Especially when letterpress printing is used one tends to use ligatures. 2. I'm not sure what you mean by metal sculpture, but indeed discretionary ligatures are most commonly used to give the text a certain flair, reminiscent of Renaissance typography, which is based on calligraphy. There are several ways to design discretionary ligatures though; some typefaces are more calligraphic than others. 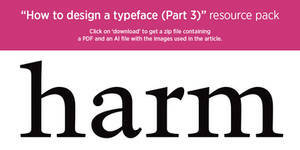 In the poster I used Calluna, which could be seen as a modern approach to late Renaissance typefaces like Garamond. So the ligatures could be a lot more elegant than seen here, or less so. Discretionary ligatures are also commonly used in logos, although this is usually custom work and not taken directly from a set of a typeface. 3. It always is. Spacing and kerning is done before the typeface is released. 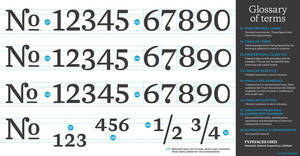 If in your software you set the kerning to "metric", it will use the spacing which is programmed into the typeface. In other words, it will use the spacing as the type designer defined it. If you have a professional typeface, this might be the best option for body text. For titles and headings it might be preferable to set the kerning to "optical", which is an automatic calibration of the spacing between the letters. This is usually tighter, but body text needs to be looser anyway. In any case, there is an awful lot of time that goes into spacing and programming typefaces. Mind you though, spacing is one of the last processes. Before that the dimensions of each letter and how they will interact with each other needs to be considered. Then the spacing, and if you really want to be a perfectionist (which professional type designers definitely are, although contextual ligatures are still quite rare) you will include contextual ligatures to improve the spacing and the distribution of weight even better. For example, the combination of "ro" is fine like that, but "rv" has a much wider gap in between the letters. So you either need to make quite a condensed /r so it can interact well with both rounded shapes and diagonal shapes like in /v and /w. Usually you don't want to condense your /r because this will change the rhythm of your text (although it could be what you're after). So usually you make a normal /r, and in case of "rv" you just kern them tighter. This however can lead to disturbances as explained with the standard ligatures, although usually to a bit more subtle degree. In any case, with OpenType technology I think as a type designer you have to ask yourself, why wouldn't you go the extra mile to improve the spacing and distribution of weight even further? Also, because each type of ligature is programmed to that specific ligature function, you don't necessarily have to use each type of ligature. It's turned on and off in a second though. Before OpenType your typeface would include a special ligatures font which had the whole alphabet attributed to all kinds of different ligatures, so you had to manually change some letters if you wanted ligatures. Very useful for titles and headings, but monk's work if you want to do it for a whole book, and if you change the font of the whole text you essentially have to re-edit the whole text yet again. Nowadays with OpenType, the ability to do perfect typography easily and in seconds is there. And finally, if you're using a script font and you want it to look like genuine writing rather than a font, you will HAVE to rely on ligatures. Professional script fonts usually have more ligatures programmed in than any other kind of typeface exactly because they try to emulate real writing, so they will usually have alternates for each double letter, or even randomize between several versions of each letter. Yeah, contextual ligatures are usually very subtle. Mastering typography is nitpicking to most people. A typeface for a book or newspaper especially has to adhere to very high standards in terms of general proportions, contrast, color, texture and rhythm. Very often great typography improve the unconscious reading experience but when you look at the theory alone you might be left with the thought why these geeks are working so hard on something people don't consciously notice. Thank you! Great other features, too. Thank you. In Photoshop the OpenType features are accessible through the Characters panel. Not all typefaces have OpenType features though. I guess other programs can also access OpenType features (I hear even MS Word can nowadays) but I only have experience with Adobe software. wait what? MS word can do this? ok walk me through one more time on how to do this? This is a really great resource! Thanks for this! In the previous article of the typography series I presented some of the basic principles of type design and we started designing a geometric sans typeface such as Futura. 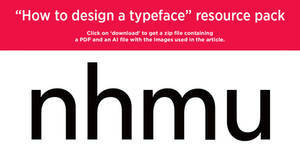 In this article we will expand that typeface and add italics and alternate weights. Or rather, I will show you how to design italics and briefly present how you can modify your regular weight typeface to create alternate weights rather than having to re-draw the whole letter.